Look good don't they? Simultaneous with the barleywine we're brewing, We're actually working on our first-ever homebrew with hops grown ourselves! 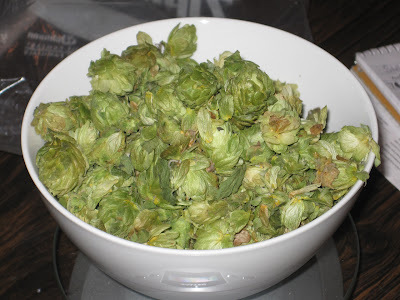 I can't really take any credit for this other than being supportive, because our co-brewer Jeff is the one that purchased the hop rhizomes, planted them at a couple different places in NJ and harvested them. 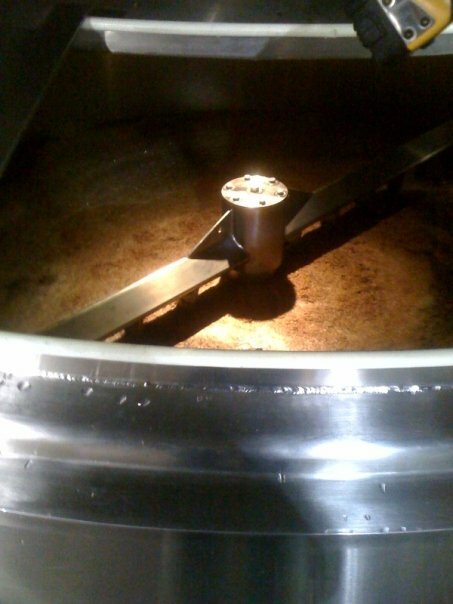 Then of course I missed the brewing with them too! 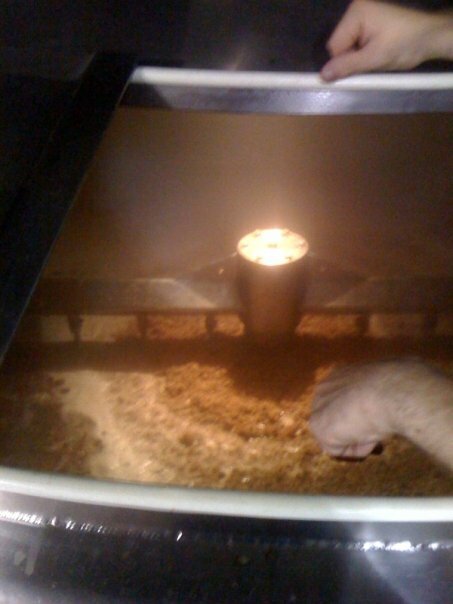 But he was kind enough to provide this picture of them right before they went into the wort. We have high hopes for this one. WHOA! So, if you happened to be following my tweets the other night, you already know that we brewed our first all-grain barleywine. This has accidentally ended up as our brewing-anniversary beer, as we brewed an excellent barleywine last September for our one year anniversary. 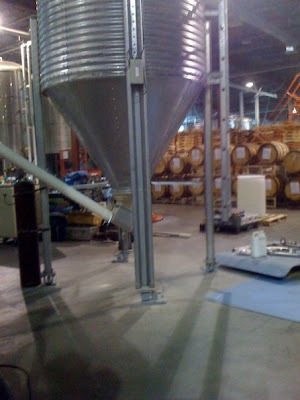 So this time around, we've grown up and are using all grain rather than malt extract. Of course, when you use 23lb of grain for a 5 to 6 gallon batch, your fermenter is going to end up PRETTY FULL by the end of the night. We figured that a blow-off tube would be necessary, but apparently that wasn't enough. 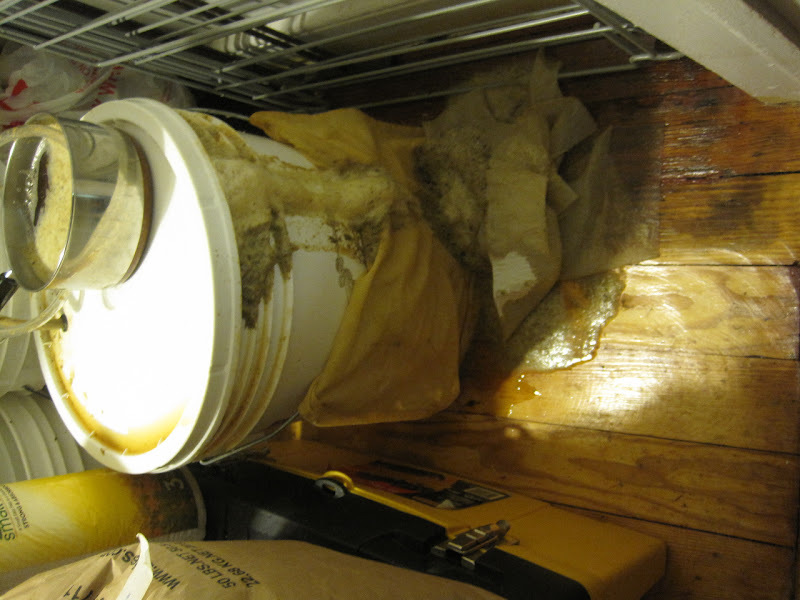 The lid was actually blown off the top of the bucket, so who knows what kind of nasties may have gotten into the beer and how this is going to end up tasting. Oh well. In the meantime, we had done a second runnings which involves sparging a second time to try to make use of the huge amount of grains. Of course, we didn't have enough space on the stove to boil both, so we figured we'd cover the second-running-wort and boil it the next day. AMATEUR MISTAKE! It was mold city by the morning. Lesson learned. Wow, I found this bar a little too late. 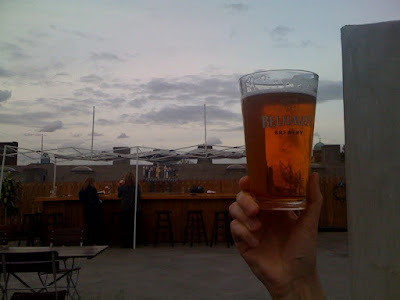 Berry Park in Williamsburg offers a gigantic indoor bar in addition to an also-large rooftop seating area complete with its own bar (which you can see above)! This new-ish place is owned by the same folks that own Zum Schneider on Avenue A in Manhattan, so the German beers are quite well represented. Of course when I finally do find out about this place existing, its windy and cool. But hey, throw on a sweatshirt and its a great place to hit on a weekend afternoon. As for the Belhaven Twisted Thistle IPA, this Scottish brewery does it right with a good balance between bitter and malty. I'd qualify this as an excellent session beer despite its 6.1% ABV. It also seems as if having this on draught is a little bit less common than in bottle form (at least according to the BA reviews). 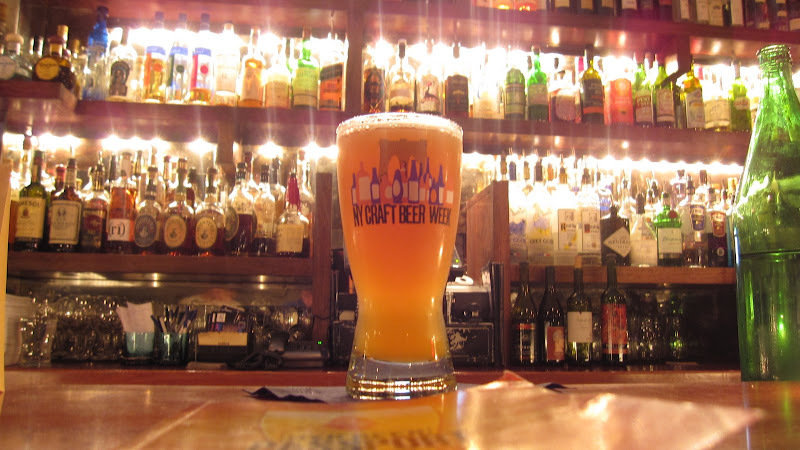 One of the Best Beer Bars in NYC is NOT a Beer Bar! The photo above was taken at Brouwerij Lane in Greenpoint, Brooklyn. 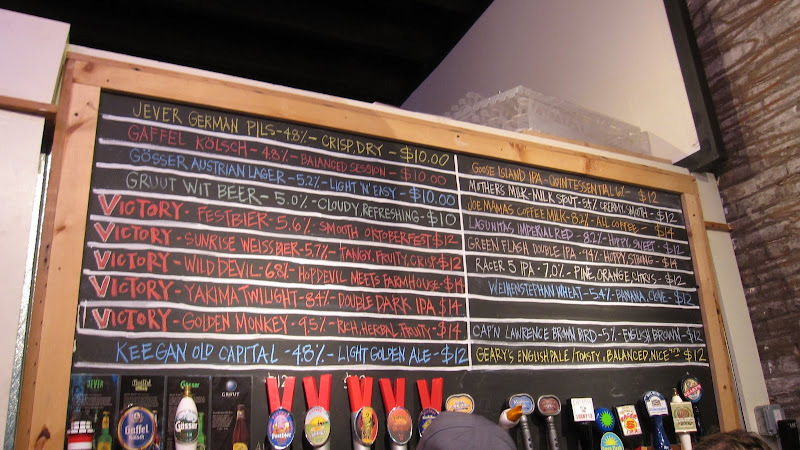 They started off as a quaint beer store with a few taps for growler fills. 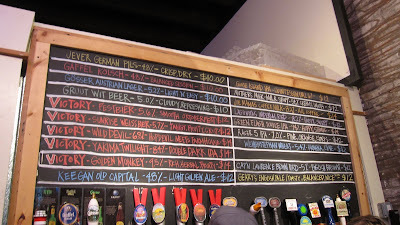 But now they have a full 19 taps, and as you can tell from the photo, there are some great choices. Now, this tap upgrade was primarily done for NY Craft Beer Week, but thankfully (and obviously) the taps are permanent! In addition to the great bottle selection and 19 full taps, you can also DRINK BEER IN THE STORE! Yes, that's right. You can drink any of the beers on tap right there in the store. Now, realize that its still a somewhat small place, so you could very well end up standing, but its well worth it for the good brews. 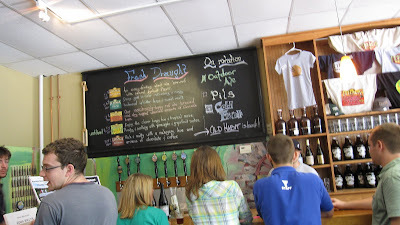 Also, the staff is very friendly and knowledgeable, willing to chat with anyone about beer. 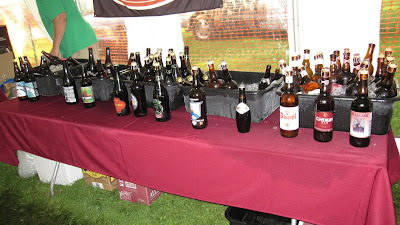 NY Craft Beer Week '09 was both the best and worst thing ever. It was the best because hundreds of places around the city were chock full of good beer, some of which being rare, high caliber stuff. On the other hand, I gained at least 5lbs, got next to no sleep and entirely lost the ability to concentrate at work. 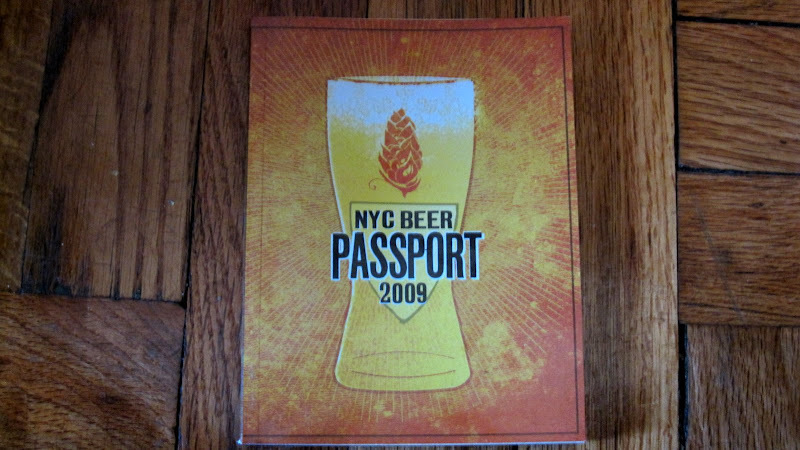 In addition to that, even though I went to as many bars and events as I could, I didn't feel like I could fully take advantage of the $35 beer passport. 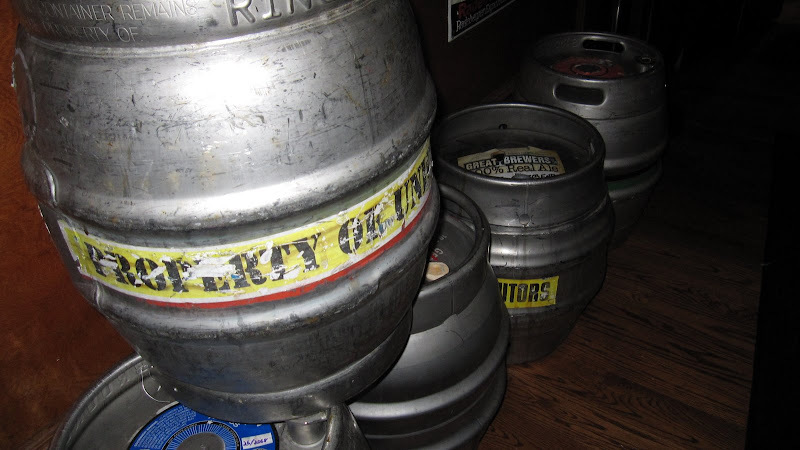 Pictured above are just a small fraction of the firkins at Rattle'n'Hum, which this week solidified itself as THE premiere beer destination in NYC. 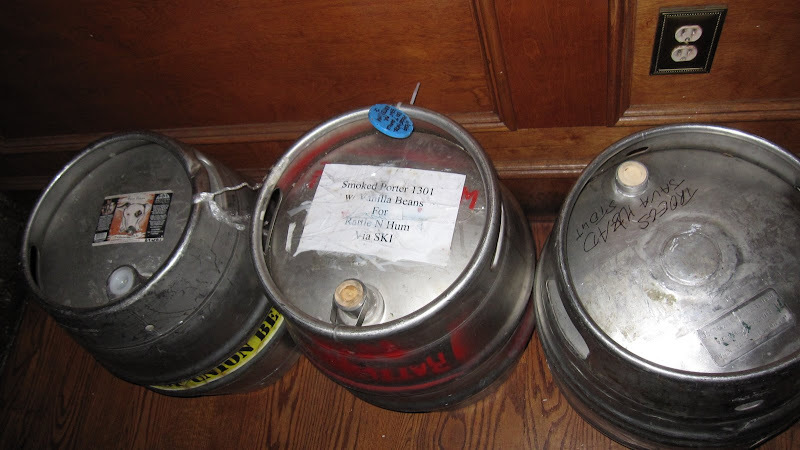 Their cask ales throughout the week were unmatched. Coupled with visits from anywhere between one and three brewers every night of the week, not even the wonderful Blind Tiger could hold up to RNH's beer geekness. But that brings me to my gripe about the Passport. You pay $35 for a booklet of information about events and discounts at bars across the city. Sounds good on the surface, but the passports were printed in July. Not one bar that I visited had all 3 beers advertised as the discounted beers in the booklet. I understand the difficulty of planning this out, but there needs to be a better system. 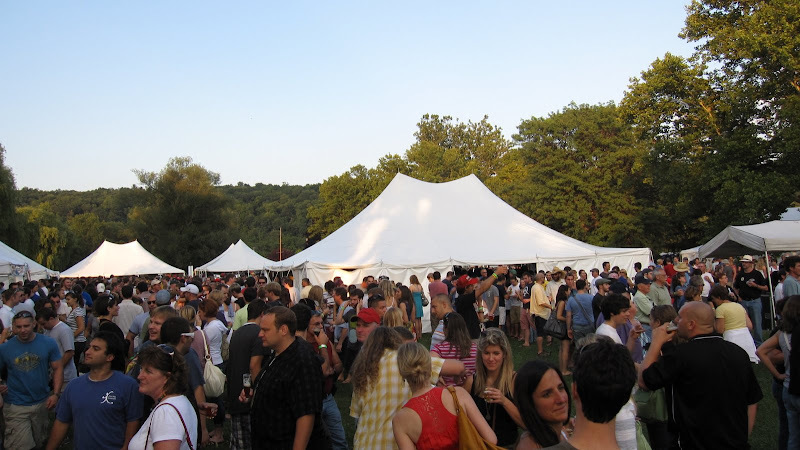 In 2008, Craft Beer Week sold tickets to beer crawls of individual neighborhoods. And while somewhat limiting, this worked for me in that it forced me to check out new bars that I wouldn't ordinarily visit. At the same time, there were WAY more bars involved this year, so I don't see an obvious solution. So in conclusion, NY Craft Beer Week was a great week celebrating good beer in the best city in the world. BUT, its far from perfection. I'm sure as they continue it, it will improve exponentially. I have faith. 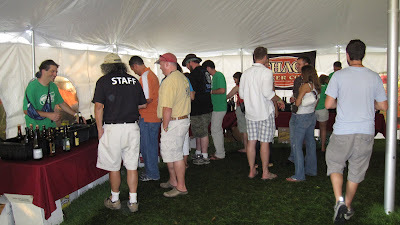 Here are a few photos from the Ithaca Brewfest which took place on 9/4/09. We did the VIP experience which cost $35 more. Going VIP was definitely worth it, but it would have been much, much better if we didn't get a flat tire on our 3 hour drive to Ithaca, causing us to miss the initial VIP-only first hour and the following 2 hours. We still were able to sample a ton of brews that no one else in the brewfest got to have though, so hey, whaddya gonna do? The Ithaca Beer Company in Ithaca, NY. Small, but excellent beers. Funny thing, I spent four years at Ithaca College, and a few weeks ago was the first time I'd visited the brewery. Guess that speaks to my beer renaissance not occurring until after college. Oh well. Ithaca Brewing offers free samples and free tours. 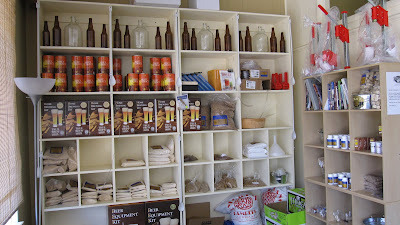 Another great thing about visiting the brewery is that they have a bunch of homebrew supplies for sale right there. 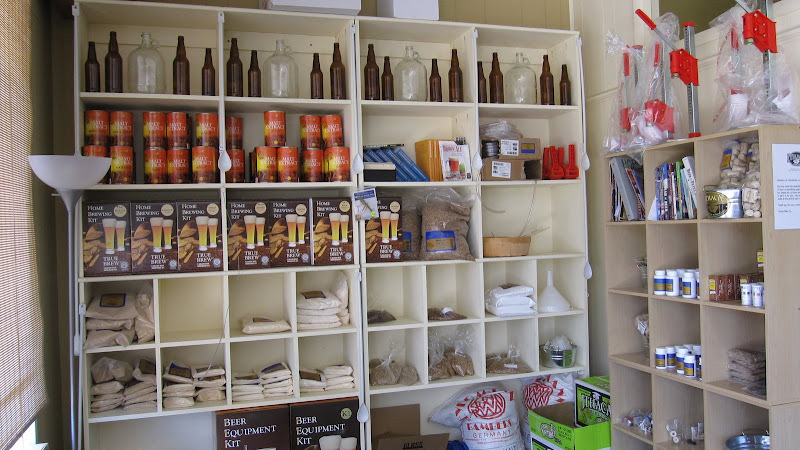 This should be done at more breweries and if we ever open a brewpub, we'd love to be able to sell homebrew supplies as well. On our tour we got to see the relatively small operation. 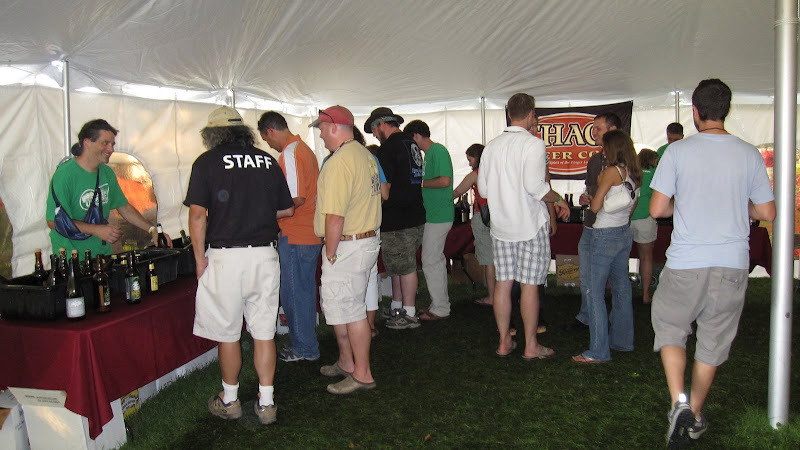 True fact - Only 7 people are actually involved in every single bottle of Ithaca Beer that is out there. And 2 of those are the brewers! 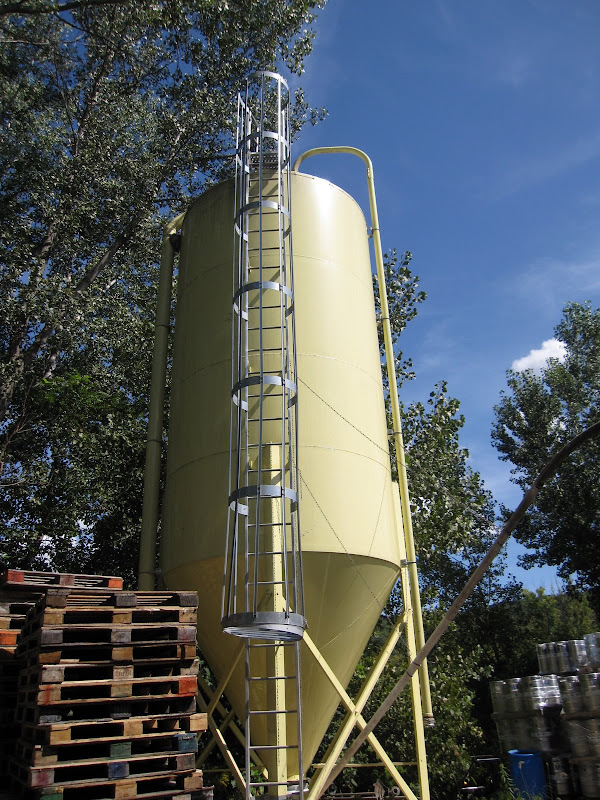 This is their two-row silo. That's a lot of malt! Homebrews awaiting their wedding imbibers. The beertographer grabbing some more cold homebrew! Heather made special, simple tags so that the wedding guests would be able to tell what they were about to try. good beers, bad pours, awesome masonic jars! Wedding & Homebrew: Perfect Together. Noticeably absent is Tim, who was off being a groom, but he was there in spirit. At one point, Jeff and I ended up behind the bar serving beer. I must admit, it felt very right to be standing behind a table serving beer we made to people. I could really get used to doing that. And other craft selections such as Brooklyn Pennant Ale and Weyerbacher Old Heathen Imperial Stout during the wedding. I spent most of my time drinking our homebrew, so I couldn't quite partake in the other selections. And it felt good to hear a few other people say the same, that they didn't even get a chance to try the other beers because they were drinking our homebrew all night. Off-Centered Ales for Off-Centered People. That's Dogfish's slogan. I think this is about as off-centered as it gets. Would you have any trouble drinking a brew where one of the primary ingredients was corn that was chewed and spit out by the brewers? Unfortunately, it's a brewpub exclusive. So head down to Rehoboth Beach to get some! And the related New York Times article. 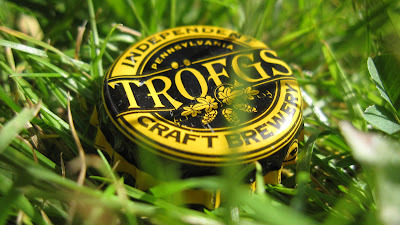 This cap photo (from a bottle of Java Head) was taken in Ithaca, NY this past weekend. Some friends and I celebrated a bachelor party for our friend Tim with camping, the Ithaca Brewfest and the Ithaca Brewery. I'll have a full post detailing the weekend next week. Man, I wish I had an opportunity like this. It was definitely fun to spend my day with Chelsea, but a brewday with Oskar Blues? That's a whole new level. Our good friend Adam over at the Denver Beer Blog recently won this opportunity by merely being the first person to respond to an Oskar Blues' Tweet. Sweet. Here's his story. This past Tuesday, Oskar Blues Brewery in Lyons, CO announced a simple contest via their twitter account (@oskarblues). The first person to email them responding to their tweet would win the right to “sit in” on the brewing of their famous Ten FIDY imperial stout. Being the huge nerd that I am, I was obviously in front of my computer at the time and quickly fired off the winning email. Oskar Blues opened in Lyons as a restaurant in 1997, developed into a brewpub in 1999, and started canning their beers in 2002. That’s right, canning! They are one of the only craft breweries I know of that can all their beer, and the cans definitely do not hurt the flavor one bit. 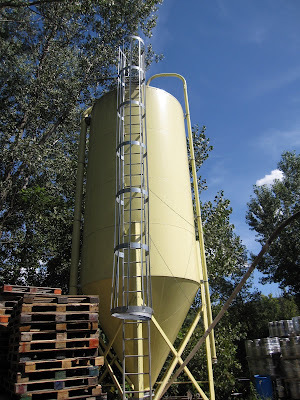 The brewery recently expanded in 2007 to a new 35,000 square foot facility in Longmont, CO and can now produced up to 150,000 barrels of beer per year! 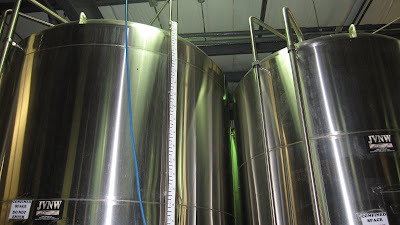 This is where I met up with Tim Matthews to watch him brew Ten FIDY, their highly acclaimed winter seasonal. At least I expected to just watch him, but Tim put me to work right away allowing me to dump bag after heavy bag of oatmeal into the mash tun as we started the process. Quite the workout at 9:30 in the morning! After that I basically just followed him around while he explained each step in the process and I offered my assistance where I could while trying to annoy him as little as possible. 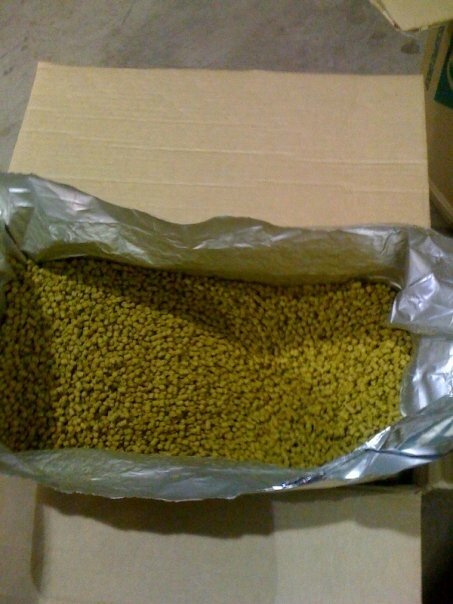 This assistance included carrying bags of malt here, measuring out hop pellets there, and even being allowed to dump in a few buckets of the pellets into the boil kettle myself! Six hours later the brew was just about done and I was completely exhausted. Who knew brewing is such hard work?! Somehow though I managed to find my second wind and worked up enough energy to sample some of their special taproom only beers including barrel aged versions of their Mama’s Little Yella pilsner and Old Chub Scottish ale. Both were really tasty and great way to cap off a very interesting day and where I learned a great deal about brewing and the craft beer industry. Oh and be sure to look out for the batch of Ten FIDY I “helped” brew. It’ll be in stores in October. Pretty awesome story. I'm definitely jealous of Adam's experience. Make sure you remember to check out the Denver Beer Blog. Many thanks to Adam for the photos and the writeup. $35.00. Not a large price to pay for discounts at literally hundreds of bars across the Big Apple. I'd go over some of the bars and discounts involved, but there are so many it would take me forever. 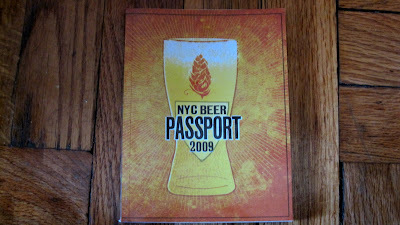 What you should do is check out the website at nycbeerweek.com. There you can find all the participating bars and stores and look at their individual discounts. You can also find info about the multiple events going on every single day starting next Friday September 11th. I was seemingly a mere 15 years old when Old Rasputin was first brewed. It's sort of weird now seeing as though so many brewers have bourbon barrels that they can age their stouts in (or other styles too). I would never complain that there are too many barrel-aged beers, but this will inadvertently lead to brews that are not quite as good as others. 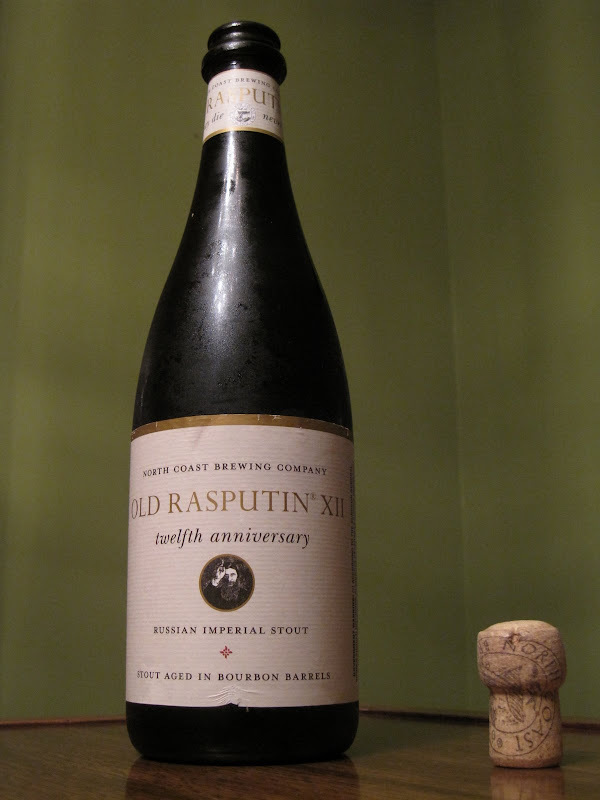 Luckily, North Coast Old Rasputin XII is very good. It's not as good as a barrel-aged beer such as Kentucky Breakfast Stout, but that's a large order to fill. 11.2% is actually a somewhat manageable ABV in comparison to some of the other bourbon stouts. I guess one's main complaint with this beer is its cost. I paid $18.99 at Boonton Liquor Outlet Wine Cellars, which seemed a little high for a bottle that disappeared quickly. But maybe that's just a statement about the style. Coming Soon, check out the video from the brewmaster, Sam Calagione! 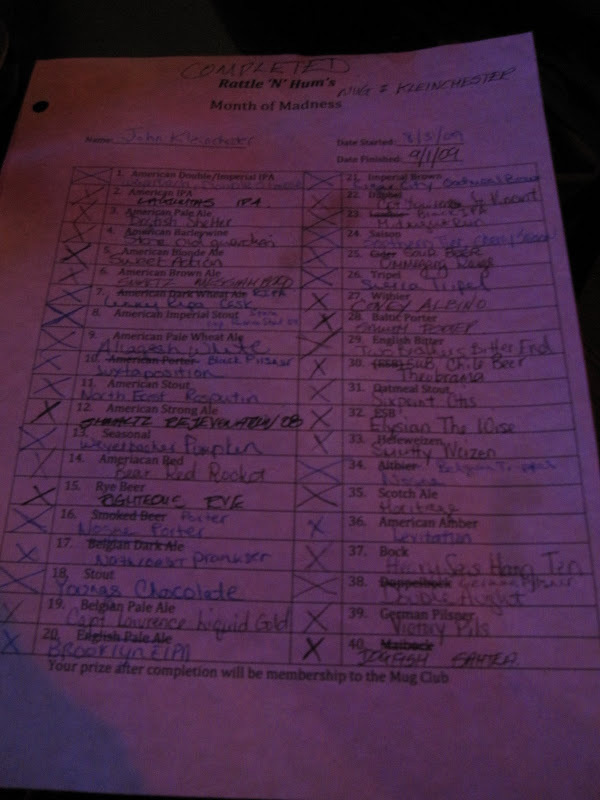 In order to join the illustrious Rattle'N'Hum Mug Club, you have to drink 40 different styles of beer in a one month period. I was able to finish with 2 days to spare. My wallet is considerably lighter and my gut is slightly bigger. But it was well worth it. Belgian Pale Ale at its finest. This beer seems to be a bit more rare than some of your other run of the mill belgians, but its well worth the $5 or so to pick up. This was the brew that made me realize that I highly enjoy dry flavors in a pale ale. Man, iPhones aren't the greatest cameras. Two days in a row of low-qual photos. Sorry about that. 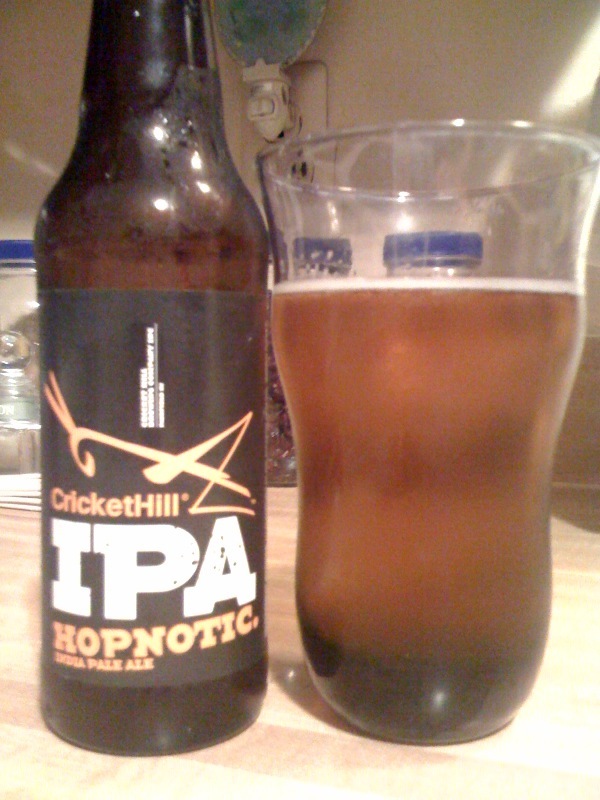 Anyway, this was my first sample of a Cricket Hill beer, a NJ brewery not far from where I grew up. 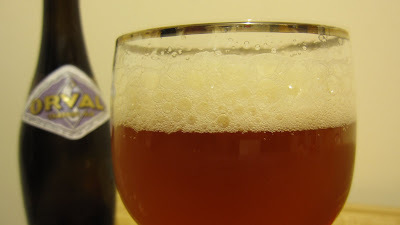 It's a take on the English IPA style, and it's a fair attempt. Not to knock the brewery or anything, as I haven't tried their other selections, but I wonder how a brewery of this small size can survive in the current market. 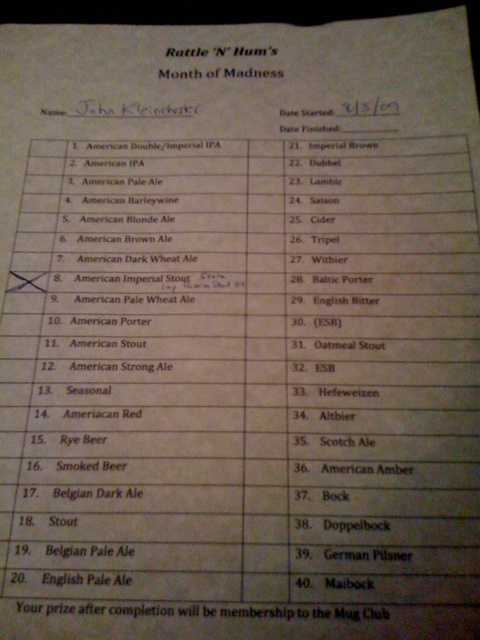 They have about 12 total beers and none of them are rated higher than a B on BeerAdvocate. 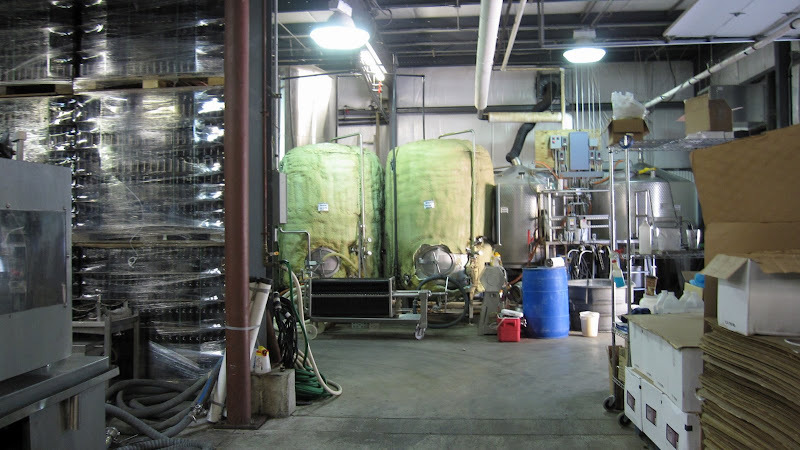 I'm very curious and would like to visit the brewery sometime soon to learn more.